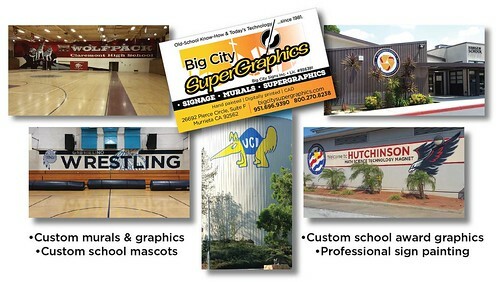 We’re your GO-TO source for school spirit murals and graphics! Click here to fill out our quick-response contact form. Received a Gold Ribbon or other California Public Schools award? Congratulations – we are School Award specialists! Click on business card below to see the photo gallery of our school murals, Gold Ribbon and Distinguished School award graphics.